Why Join the Jackson County Builders Association? Here are just a few reasons to join JCBA: 2017 Membership Dues $445. As a builder, you know how tough it is to make a living these days. Not only do you have the usual business challenges of managing workers and suppliers, attracting buyers and keeping the books straight, but you have to keep up with the latest codes and regulations from federal, state and local authorities. You've got to be on the job site every day, not sitting in the office researching the government's latest rules. How do you stay up-to-date, grow your business and still have time for your family. A big part of the answer is to join the Jackson County Builders Association. Our association has an organization in place to keep you informed on the latest regulations and trends in the housing industry, give you ideas on how to expand your business and make your voice heard in Washington and Atlanta. You'll also have the opportunity to participate in educational and recreational programs where you can exchange ideas with other builders while relaxing "away from the office". Sponsorship of Jackson County Builders Association events can provide your company with a captive audience and maximum exposure to a wide range of industry professionals you would have difficulty reaching through other marketing methods. JCBA hosts general membership meetings, golf outings, clay shoots, bowling night, summer bash and Holiday casino night that are sponsorship opportunities for our Associate members. JCBA actively promotes our "Do Business with a Member" campaign and provides our sponsors with the opportunity to promote their products or services at their sponsored event. Literature is prominently placed at our registration area, and arrangements can be made for table top displays. When you sponsor a event your company name and logo are displayed on signs, t-shirts, flyers and our monthly newsletter. When you join JCBA, you automatically become a full member at the state level (Home Builders Association of Georgia) and national level (National Association of Home Builders). That’s three memberships for the price of one. Currently ranked #11 on Fortune Magazine’s “Power 25” Advocates, NAHB has the grassroots strength of over 215,000 members to defeat excessive regulations and defend affordable housing initiatives on Capitol Hill, in your state, and in the communities where you do business. What better way to expand your business circle than by getting involved in a trade organization dedicated to the building industry? As an alliance of over 400 members of Jackson County Builders Association and 215,000-plus members nationwide from all areas of the industry, we provide hundreds of ways for you to meet and build relationships with fellow professionals, customers, and suppliers. Membership meetings, golf outings, clay shoots, bowling night, summer bash, Holiday casino night and seminars are networking opportunities available to our members. Reduce your day-to-day business costs with these member-only discounts. NAHB's purchasing power means big savings on travel, financial services, and auto insurance. Your membership entitles you to discounts on hotels, car rentals, office products, PCs, payroll services, overnight delivery, and more. Participating, nationally known companies include Dell Computers, Liberty Mutual, Pitney Bowes, Williams Scotsman, and Hertz, to name a few. To view a list of discounts, click here. Through the HBA's Member Benefits Mart, members can obtain a wide range of insurance including Workers' Compensation and General Liability Insurance and related benefits for themselves and their businesses. Enhance your professional credibility and visibility by belonging to JCBA, HBAG, and NAHB. You will receive a free listing in the JCBA annual membership directory that is distributed throughout the county. It is frequently requested and used by people moving to the Jackson County area as they are looking for builders, subcontractors, real estate agents, loan originators, and homeowners insurance. And….. it’s fun!! We have golf tournaments, clay shoots, parties, and other enjoyable events throughout the year. We also attend the NAHB and HBAG annual conventions. This year we are going to Destin, Fl and Orlando! "Maybe later" Why wait? The sooner you join, the sooner you can begin benefiting from the services offered by Jackson County Builders Association. We can provide you with information and education you need to keep your business costs down and your profits up. "I can't afford it" You can't afford not to join! Your active participation will reap cost saving benefits such as member discounts that are available exclusively to association members as well as business leads. Becoming a member of JCBA is one of the most solid business decisions you can make. A portion of your dues is even tax deductible. How can you afford to miss this opportunity? "I'm already involved in too many organizations" How many of those organizations are trade related and directly tied to your livelihood? 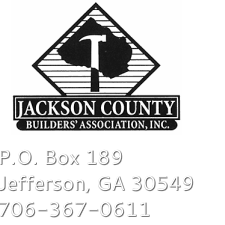 The Jackson County Builders Association exists to help you stay in business and prosper in the building industry. Membership should rate at the top of the list for builders and associates who wish to grow a successful business!